If your grilling experience is limited to roasting a hot dog on a branch over an open fire when you were a kid at camp, you’ve just scratched the surface of what can be a very exciting (and somewhat intimidating) way to cook. To start your grilling journey, two key terms to know are direct and indirect — the two basic methods of grilling. Direct grilling means that the food is placed on the grill directly over the full force of the heat source, whether it’s charcoal, hardwood, or gas. (See the figure below.) Just about every food, from meats to vegetables, can be grilled directly over fire, including hamburgers, hot dogs, pork chops, lamb chops, boneless chicken breasts, beef tenderloins, and all types of fish and shellfish. Grilling over direct, intense heat sears the food, coating its exterior with a tasty brown crust that’s loaded with flavor. Steamed or boiled foods don’t have this flavor advantage, nor do foods that are stir-fried or microwaved. The techniques of sautéing, deep-frying, roasting, and broiling create this crusty effect, but grilling rewards you with a seared crust and the extra benefit of smoky flavoring that comes from the charcoal, wood chips, or hardwood chunks. The primary difficulty with direct grilling is that you must watch your food closely to prevent it from burning. On a charcoal grill, the coals should be spread in a solid layer that extends about 1 to 2 inches beyond the edges of the food. In most cases, the grill grid — the metal latticework you place the food on — is placed 4 to 6 inches from the heat. The placement of coals depends on the type of grilling you’re doing. It slows down the cooking process. How many times have you used direct grilling to cook chicken and ended up with skin charred beyond recognition and meat that’s practically raw in the center? With indirect grilling, food is cooked in a covered grill by heat that never directly touches it, and is comparable to oven roasting. 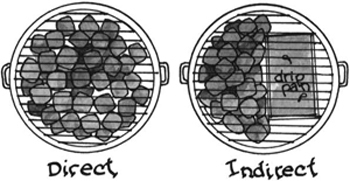 Indirect cooking actually gives you two types of fires (or two levels of heat) in one grill. You have a direct fire that can be used to sear food and an indirect fire to cook food slowly and thoroughly. Indirect grilling eliminates the possibility of dangerous flare-ups. Fat drips from the food into the drip pan, rather than onto the hot coals, lava rocks, or ceramic briquettes. Indirectly grill any large cuts of meat or whole birds, poultry pieces, pork tenderloins, ribs, or large roasts for delicious results.